When you decide to buy a particular used car, you should ensure that the car will hit the road safely and smoothly. Many people fail to inspect the car before buying it. It leads to many issues in your car that includes breaks down, tears and wear and some other problems. These possible issues will turn your joy into something dreadful. Some of the repair problems may cost you more. If you want to avoid wasting your hard-earned money, you can inspect the used car before making any decision. The quick and quality check will bring you lots of benefits. There are many important reasons available to inspect the used car, but few of them are given below. The main reasons to inspect a car are to find out if any problems are present in the car. Many people opt for test driving to check the condition of a vehicle, but they fail to get the desired results. To avoid inconveniences, you can opt for car inspection. It is the right way to know the present condition of your car. Finding the major problems is one of the important processes because it not only brings you a peaceful mind but also bring you a fantastic chance to save money. The main benefit of getting car inspection services is that it will bring you a hassle-free mind. If you want to drive the car with no worries about any problems like breaking down, you can ensure that your mind is at peace. The car inspection service is the right solution that will bring you that peace. Once you inspect the vehicle properly, you need not deal with any stress such as faulty parts, cash spend on any mechanics and much more. It is the right thing required by every modern driver because it keeps them calm while they drive on road. Unfortunately, if you involved in an accident, you need to immediately get the things fixed. It is always helpful to get the inspection before fixing the repairs or other issues. It will aid you in understanding the kind of problems in the damaged car. You may also find that if any serious problems are there in your car. With the required information, you can go to repair your car. The reliable shop never charges you to change your light bulbs. It is another important benefit of getting car inspection services. The busy life schedule affects modern people to maintain their car properly. Additionally, they also fail to change the oil regularly. It will lead to costly repairs and other problems. To save money, you can regularly inspect your car. The certified team of mechanics not only check the engine oil and but also guide you to change it on time. 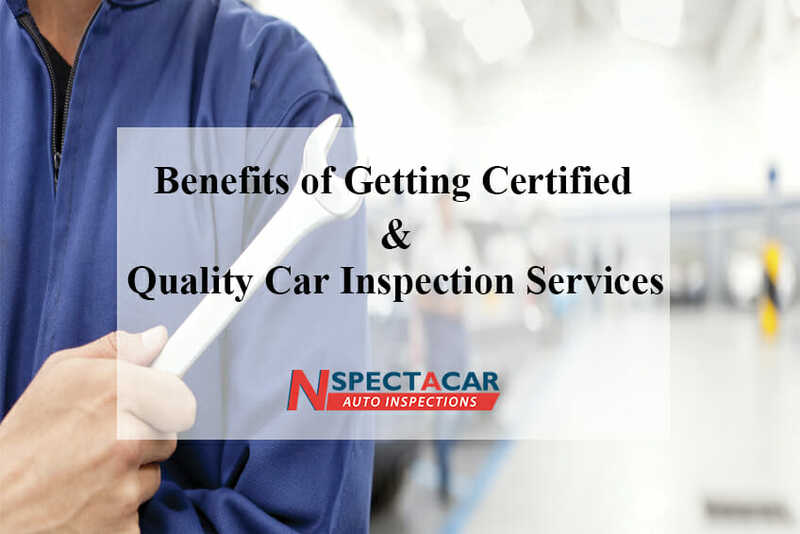 Nspectacar comes with a certified and reliable team of mechanics who can inspect all kinds of used cars and deliver a precise inspection report to the clients at affordable rates.